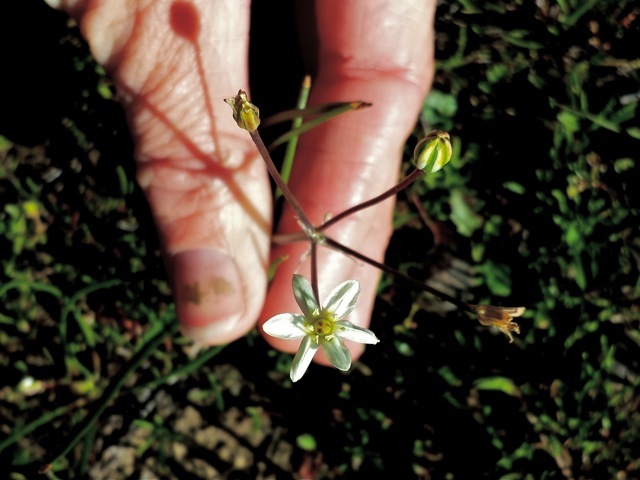 Here is a tiny, innocuous plant that is widespread throughout California but is verrrry easy to overlook. 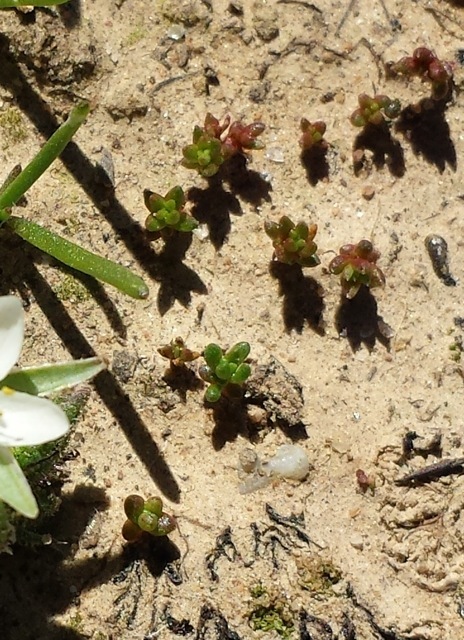 Diminutive sand pygmy weed (Crassula connata) only grows a few centimeters tall; usually 2-6 cm, and 10 at the most. It’s in the same family with larger succulents such as dudleya–just much smaller. Its leaves are tiny fleshy nubs that can be either green or red, and rounded or acute. The innocuous flowers are shorter than the surrounding sepals, which can be hard to distinguish from the leaves. True to its name, look for this little succulent growing in loose, sandy, or gravelly soils–often where not much else is growing. According to the Marin Flora, this is one of many species that are native to both the western US and south America . 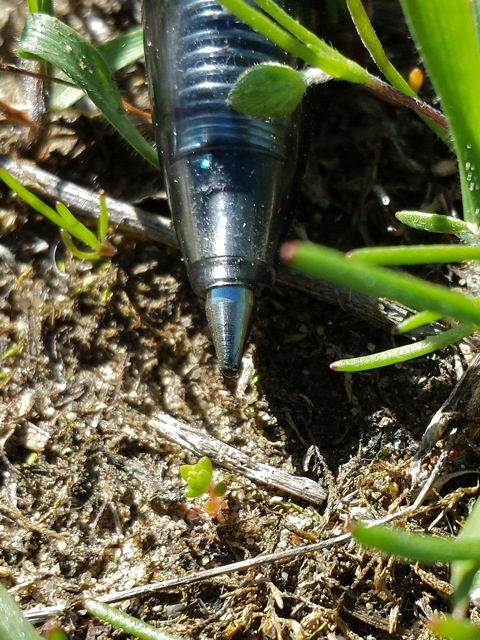 The native sand pygmy weed is one of many similar-looking other species of pygmy weed, all of which look somewhat similar–such as water pygmy weed (Crassula aquatica) and the non-native moss pygmy weed (Crassula tillaea). Bright bunches of pansies grow in a grassy meadow. They sport classic yellow flowers, decorated with blackish-purple lines. 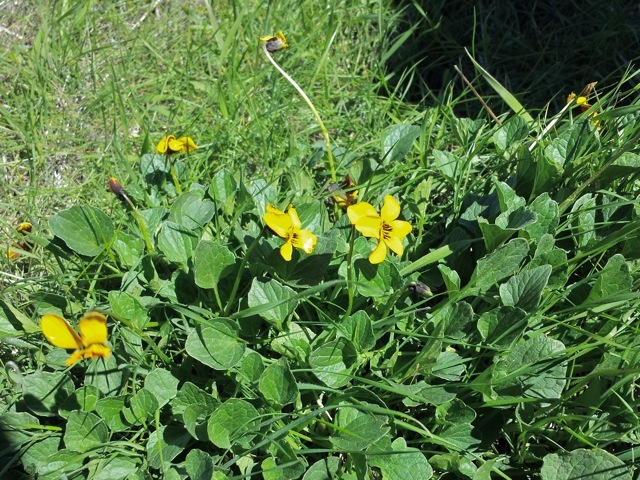 This is Johnny jump-up (Viola pedunculata), a large native violet also known as California golden violet or yellow pansy. Johnny jump-ups are mostly found in the grasslands of western central and southern California, as well as in woodlands and coastal scrub. Unlike many violets, their leaves are ovate rather than classically cordate or heart-shaped. 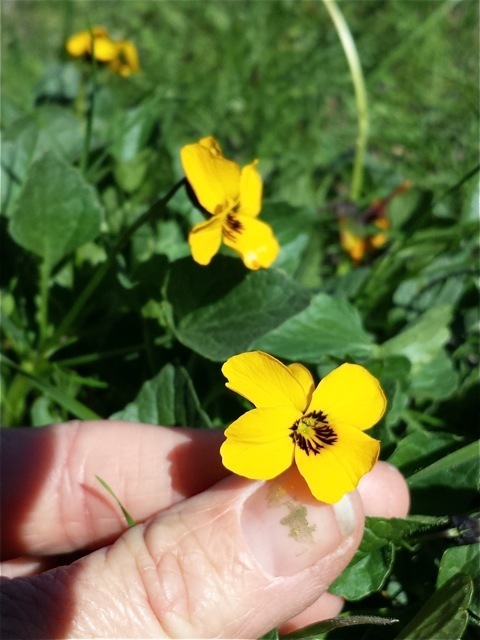 Johnny jump-ups can often be confused with the much more widespread goosefoot violet (Viola purpurea)–but it has larger flowers (generally 1 to 2 cm), more uniformly ovate leaves, and the expert eye will note that it also lacks the cleistogamous* flowers of the goosefoot. *Cleistogamous flowers never open, and pollinate themselves. The opposite–a “normal” flower–is chasmogamous; hence, opening (like… a chasm?). There’s a good description and some photos of cleistogamy in violets on this web page. Delicate muilla is famous for being allium (the Latin name for the onion family) spelled backwards. And it’s true that superficially Muilla maritima (sea muilla) does look like an onion. Flowers have six dark-tipped stamens aligned tidily with six pale, tongue-shaped petals. From 4 to 70 flowers grow in open umbels on each plant. Leaves are long, narrowly strap-like. One easy way to tell that you’re looking at a muilla, not an allium, is the lack of an onion odor. Also, muilla has small bracts as opposed to the large bracts which enclose the entire umbel of flowers on young allium. Sea muilla grows in the coast ranges and Central Valley, and down into southern California. It can be found in chaparral, coastal sage scrub, grassland, woodland, and has a loose affinity with serpentine soil. The photos here were taken at the Jepson prairie. 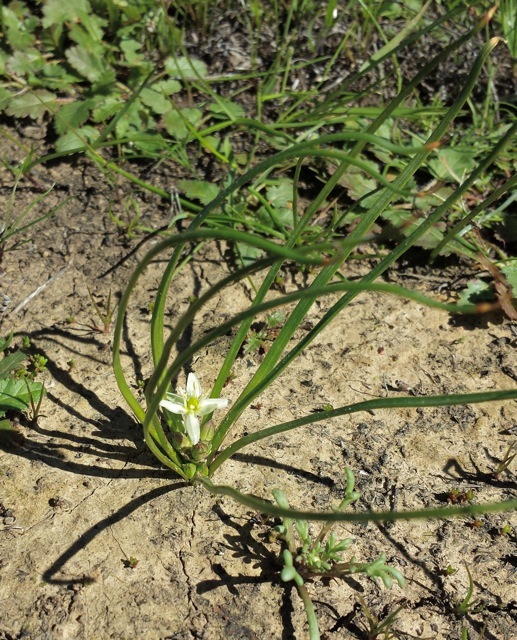 It is in the Themidaceae (Brodiaea family). It’s not exactly flora, but I recently came across this sweet poem that is sure to appeal to many a naturalist. 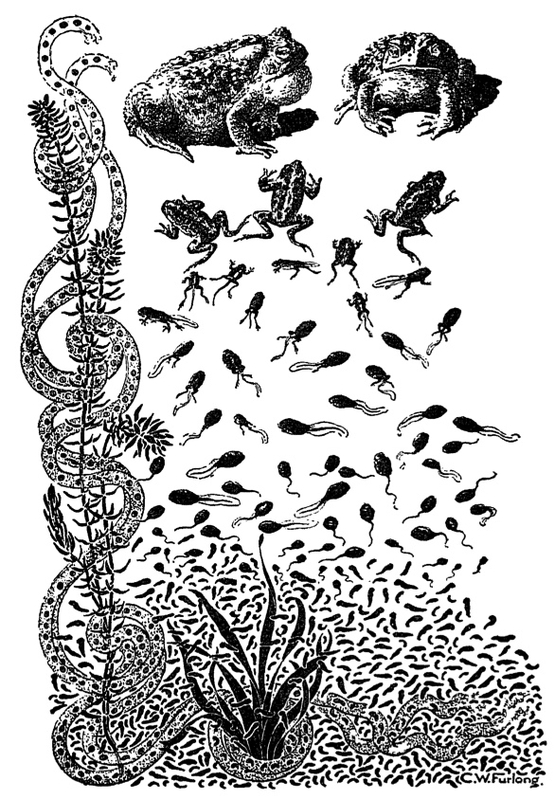 It was written by Langdon Smith, who was born in 1858: the year before Darwin published On The Origin of Species. During his life, Smith was known as a journalist and war correspondent rather than a poet–as far as anyone knows Evolution is the only poem that came out of all the many words he penned in his career. It was published not long before he died young, at age 50. Though it is a product of its time (I’m not crazy about the nod to religion at the end–and the science is either figurative, badly outdated, or both) this is still a lyrical and charming piece. And crept into life again. And the night of death was passed. We talked the marvel o’er. Til our brutal tusks were gone.